We’d love your help. Let us know what’s wrong with this preview of The Time It Never Rained by Elmer Kelton. To the ranchers and farmers of 1950s Texas, man's biggest enemy is one he can't control. With their entire livelihood pegged on the chance of a wet year or a dry year, drought has the ability to crush their whole enterprise, to determine who stands and who falls, and to take food out of the mouths of the workers and their families. To Charlie Flagg, an honest, decent, and To the ranchers and farmers of 1950s Texas, man's biggest enemy is one he can't control. With their entire livelihood pegged on the chance of a wet year or a dry year, drought has the ability to crush their whole enterprise, to determine who stands and who falls, and to take food out of the mouths of the workers and their families. To Charlie Flagg, an honest, decent, and cantankerous rancher, the drought of the early 1950s is a foe that he must fight on his own grounds. Refusing the questionable "help" of federal aid programs, Charlie and his family struggle to make the ranch survive until the time it rains again-if it ever rains again. To ask other readers questions about The Time It Never Rained, please sign up. Are Elmer Kelton books considered clean reads?? "Men grumbled, but you learned to live with the dry spells if you stayed in West Texas; there were more dry spells than wet ones. No one expected another drought like that of ’33. And the really big dries like 1918 came once in a lifetime. “'Why worry?' They said. 'It would rain this fall. It always had.' "
The novel is set in West Texas during the 50’s when the region endured and barely survived a drought that lasted seven long years. And Kelton was there – not as a rancher, but as an agriculture journalist. He covered the desolation on a daily basis and was intimately acquainted with what it meant for the people who were forced to cope with its devastating manifestations. As a sideline, Kelton had been writing fiction since the late 40’s and his stories were first published in pulp magazines. When those went out of business, he was able to get his first novel, Hot Iron, published in 1955. Twice he began a novel about the drought but his publisher was not interested. It was too different – too unconventional. Its plot simply did not contain the elements ordinarily found in the Western novels of the day. There was a lot of gray and very little black-and-white. It was a story about change and how people attempted to adapt to it, but not always with success. In other words, there was not enough action; it was too tame as far as the publisher was concerned. One might even say, too literary. In the early 70’s, after several more of Kelton’s novels were published, he scrapped his first two efforts and began a third draft of a novel about the drought. The Time It Never Rained was the happy result. Seven of Kelton’s novels have received the Western Writers of America’s prestigious Spur Award and the National Cowboy and Western Heritage Museum has bestowed its coveted Western Heritage Awards on him for three of his novels. These are the equivalent of Pulitzer Prizes in the Western book world. The Western Writers of America eventually named Kelton “the number one Western Writer of all time.” Willa Cather finished a distant second. Kelton’s protagonist is Charlie Flagg, "[who] was past fifty now, a broad shouldered man who still toted his own sacks, dug his own postholes, flanked his own calves." His ranch would have been considered a mid-sized one in West Texas in the 50’s. It consisted of fifteen sections, almost ten thousand acres, but he owned only three of the sections. He leased the others. Cattle and sheep ranching in West Texas on any size scale at all required many acres even in the best of times. It took four acres to feed just one sheep and twenty to feed one cow. During the dry times, even those ratios would not suffice. Therefore, ten thousand acres was not a large ranch. Charlie was an ornery cuss. He was also a libertarian at a time when that particular philosophical label was not in vogue. While the other ranchers in the area accept government assistance during the drought, Charlie will have nothing to do with it. Charlie says that when a man took government assistance "he sold his freedom bit by bit, and was paid for it on the installment plan," and that "the politician promiseth, and the bureaucrat taketh away." "What I can’t do for myself," he says at one point, "I’ll do without." "He went through cruel hard times when there was others takin’ a pauper’s oath so they could get money and food and free seed, but he never would take that oath. He come within an inch of starvin’ to death, and he died a poor man. But he never owed any man a debt he didn’t pay and he never taken a thing off the government." And what about Charlie? Does he prevail? Rather than disclosing the answer to those questions, I would recommend that everyone read this atypical Western novel and discover the answers for themselves. And what about today? It would seem that the more things change, the more they remain the same, as indicated by this headline: In 2014, Texas Drought Could Be Worst Ever In Some Areas, Climatologist Says. "It's as old as mankind...the hope of gettin' somethin' for nothin' or gettin' more out of the pot than you put in it. Nobody's ever made it work yet. Nobody ever will." "It's a good life, son, but sometimes a damn thin livin'." "As a way of makin' money, ranchin' is awful highly overrated." "Only real difference I see between ranchin' and poker is with poker you got some chance." "A ranch without any cows is like a man walkin' down the street without any pants on. He's just not respectable." "I reckon we just keep the ewes so we can afford the cows." "Some people say we ought to let the coyote alone, that we got to have them for the balance of Nature. But most of these people live in the cities, where they threw Nature out years ago. They ain't goin' to give up their automobiles and paved streets and sewer systems to get Nature back, but they're damn sure free with advice on what the other man ought to do." "I say man has got to be considered a part of Nature's balance, too. You can't raise coyotes and sheep together any more than you can have paved streets and coyotes together. You can't eat a coyote or wear his fur." Selecting talking books for a friend. She's listening to Kelton's Wolf Buffalo book, her first by the author, and she wants more books by him. This one, 'Time It Never Rained,' is top quality. If you haven't read Mr Kelton, this would be a potential starting place ... It deserves the Spur Award it won. "Spur Awards are literary prizes awarded annually by the Western Writers of America (WWA). The purpose of the Spur Awards is to honor Selecting talking books for a friend. She's listening to Kelton's Wolf Buffalo book, her first by the author, and she wants more books by him. This one, 'Time It Never Rained,' is top quality. If you haven't read Mr Kelton, this would be a potential starting place ... It deserves the Spur Award it won. "Spur Awards are literary prizes awarded annually by the Western Writers of America (WWA). The purpose of the Spur Awards is to honor writers for distinguished writing about the American West." "Charlie Flagg won't accept government allotments for feed for his dying cattle and sheep; he'd rather lose land and switch to goats (they go anywhere and don't hardly need nothing to eat) out in Rio Seco, Texas, in the worst drought since '13. Events vindicate him as the government in its bureaucratic farm-program confusion does what six years of no rain haven't: Charlie's more prosperous ranching neighbors collapse like playing cards as the endless bank loans and mortgages are called in and the land is taken over by conglomerates and accountants to whom the touch of good soil means nothing -- spelling, you know, the end of that wonderful era of Rugged Individualism. A sentimental parable of hard times bringing out the best (and worst), slow and dry like the empty plains -- a myth about as outdated as the America we used to know and love -- with a bit of contemporary racial reference (gringos vs. greasers) just to keep the young 'uns innerested." "Eight Kelton novels, Buffalo Wagons, The Day the Cowboys Quit, The Time It Never Rained, Eyes of the Hawk, Slaughter, The Far Canyon, Many a River, and The Way of the Coyote, have won Spur Awards from the Western Writers of America. Peers in the WWA also named him as the greatest Western writer of all time." I have this sweet situation going on where my partner has spent the last year reading only books I’ve recommended to him. As most book nerds can attest to, living with someone who takes every book suggestion you give them is a dream come true! So when he finally asked me to read something he loved I knew I owed it to him, but I’ll be damned if I wanted to do it. It took me a bit to get into it but once I did I was blown away by how touching and funny and lovely it was. Westerns aren’t typically I have this sweet situation going on where my partner has spent the last year reading only books I’ve recommended to him. As most book nerds can attest to, living with someone who takes every book suggestion you give them is a dream come true! So when he finally asked me to read something he loved I knew I owed it to him, but I’ll be damned if I wanted to do it. It took me a bit to get into it but once I did I was blown away by how touching and funny and lovely it was. Westerns aren’t typically on my genre radar but this one was paced perfectly, with really impressive character development, and lots of surprisingly funny bits. I was sorry to see it end. In my youth I went through a phase when I read westerns all the time, it was all I read for a couple of years.......Max Brand, Zane Grey, Louis L'Amour but I never remember reading a Kelton book. I came across a list of great western novels and this popped up so I grabbed a copy from the library. While not a traditional western genre book this was a marvelous story about a small to middlin' ranch owner in Texas during the fifties. I read reviews about nothing happening in the story and they are In my youth I went through a phase when I read westerns all the time, it was all I read for a couple of years.......Max Brand, Zane Grey, Louis L'Amour but I never remember reading a Kelton book. I came across a list of great western novels and this popped up so I grabbed a copy from the library. While not a traditional western genre book this was a marvelous story about a small to middlin' ranch owner in Texas during the fifties. I read reviews about nothing happening in the story and they are correct there isn't much in the way of a storyline, just a book about Charlie Flagg. A rancher who has a stubborn streak a mile long and a belief system that has carried him through hard times. A belief system that centers on his own independence and ability to build something by himself. What makes Charlie a great character is not so much his strengths but his obvious flaws, flaws that make him a more "real" person. Plenty of hardship as the Flagg family deals with an extended drought, immigration(Charlie has a somewhat surprising but believable view) and government subsidies. 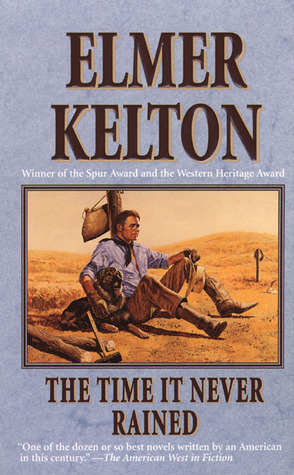 I am a bit ashamed by the fact that I never read/remembered Kelton before but after reading this book he more than earns his reputation as one of the greatest western writers of our time. I'll be trying some of his "genre" westerns in the very near future. If you're looking for a gunslinger book, this ain't it. But if you're looking for a well written character study this should fit the bill. I enjoyed this book more than all those Louis L'Amour books, including the one I had gone to the Western section to buy when I came out with this one. I don't know if it's Kelton or not, but this was a great book. Great characters, memorable setting and problems. I thought it was well-developed for what is often a formulaic genre. I enjoyed the main character, particularly his stubborn refusal to buy into a government aid program. His insistence seems to have died with him somewhere decades ago. I enjoyed this book more than all those Louis L'Amour books, including the one I had gone to the Western section to buy when I came out with this one. I don't know if it's Kelton or not, but this was a great book. Great characters, memorable setting and problems. I thought it was well-developed for what is often a formulaic genre. I enjoyed the main character, particularly his stubborn refusal to buy into a government aid program. His insistence seems to have died with him somewhere decades ago. But I loved it. But it hit so close to home just now, while I personally weigh buying hay against selling horses, and wonder how much more I can run the sprinkler before the acquifer drops lower than my well. Sometimes the book was depressing, but pretty dern timely! I've lived in the country nearly two years. I got here just in time for a drought old timers say is the worst since 1955. Lately my 88-year-old friend says this one is worse than '55. When I saw Kelton's book, a novel set against the realities of the 1955 drought--which lasted some nine years in West Texas--I knew I had to read it. I read this book at the end of last year, and finished it in only a few days. It was easy to imagine what living through such a dire situation would be like from Elmer Kelton's great descriptive use of words. He also managed to create characters that you cared about. Which, for me, is also important in the enjoyment of a good novel. It's a book that would be good to read again after a while. This writer presented his idea of the west from his past. As he admits he wasn't a cowboy but his ancestors were. Growing up in western Texas and with knowledge of what it takes to live that life, he writes an informative and mesmerizing tale of hard work, and struggling the early ranching families went through. There were some depressing times and the work needed was never enough as a drought could happen at any time as well as disease or tragic events to keep one barely surviving. Throw in government aid (with all the strings attached) with their best intentions and a racial issue between old Mexican residents of the country and the new Angloes , you have a mix of tolerance, hatred, and frustration. Kelton shows the southwestern life with the good and bad times while portraying human nature at its best and worst. A book club selection that a member had read years ago and loved, this book is more a character study than an action packed cowboy Western. It's the story of hardscrabble life during a horrendous drought in western Texas with a political bent. Charlie Flagg is an tough, old, stubborn rancher who refuses to accept government subsidies as his fellow townsfolk do. He's determined to be in control of his property as well as his own destiny. During a prolonged drought his position causes numerous had A book club selection that a member had read years ago and loved, this book is more a character study than an action packed cowboy Western. It's the story of hardscrabble life during a horrendous drought in western Texas with a political bent. Charlie Flagg is an tough, old, stubborn rancher who refuses to accept government subsidies as his fellow townsfolk do. He's determined to be in control of his property as well as his own destiny. During a prolonged drought his position causes numerous hadrships and consequences. Add to that the question of hiring illegal immigrants and you have a politically charged plot. I loved his character - he reminded me of so many men of my father's generation. His distrust of the government mirrors the feeling of many in our country today. He's got many flaws, not the least of which is a refusal to change with the times, but he's basically a decent man. Elmer Kelton's writing is spot-on. It evoked a perfect sense of place and the hardship of trying to scratch out a living during the 6 year drought. The characters' moral compasses are revealed subtly through their actions, physical descriptions, and the realistic dialogue. This style of writing almost seems old school and was so much better than some of the current writing out there today, in my opinion. I see why my patrons love Elmer Kelton so much. He obviously is a denizen of West Texas because he describes the area so vividly. He also creates characters that are multi-dimensional. Charlie Flagg has flaws as well as virtues, like any man. He is loyal but stubborn and in the 1950s when the book is set, he is part of a dying breed and aware of the fact. I also liked that Kelton put forth all sides of the arguments for government assistance during the drought. It helped me better understand wha I see why my patrons love Elmer Kelton so much. He obviously is a denizen of West Texas because he describes the area so vividly. He also creates characters that are multi-dimensional. Charlie Flagg has flaws as well as virtues, like any man. He is loyal but stubborn and in the 1950s when the book is set, he is part of a dying breed and aware of the fact. I also liked that Kelton put forth all sides of the arguments for government assistance during the drought. It helped me better understand what the government was trying to do and why as well as the many different feelings farmers and ranchers had about it. This review has been hidden because it contains spoilers. To view it, click here. There's certainly something to be said for learning to appreciate an older style of writing. I labored with Dostoyevsky for example; I even had to work at loving Chekhov. But such adjusting periods usually pay off because the literature is so rich and beautiful and, for the writer, informative about the possibilities in craft. I've labored long and hard with Elmer Kelton's The Time It Never Rained, because it is an historical novel rooted firmly in a particular culture, a particular era, a parti There's certainly something to be said for learning to appreciate an older style of writing. I labored with Dostoyevsky for example; I even had to work at loving Chekhov. But such adjusting periods usually pay off because the literature is so rich and beautiful and, for the writer, informative about the possibilities in craft. I've labored long and hard with Elmer Kelton's The Time It Never Rained, because it is an historical novel rooted firmly in a particular culture, a particular era, a particular economy. It addresses issues of race and class, of politics, of environmentalism. It is a complex novel. But my problem with it is this: it takes too damned long to get itself underway, and the labor doesn't really pay off. Sure, the characters that start out as stolidly stereotypical do eventually develop distinct personalities, individual motives, a life outside the plot. But before Kelton can let these characters live and breathe on their own, he feels the need to utilize them toward some other Purpose, with a capital P: namely, he needs to take the time to explain to us, in textbook detail, the harsh mechanics of ranch life, the prejudices of every class of character, and -- most importantly -- his conservative, anti-government political slant. And he takes forever doing it. I suppose that, given the beauty of the second half of the book, that wait might seem worth it. But here's my problem: While Elmer Kelton takes somewhere between 120 and 150 pages to set up the socio-economic realities of his novel, Jane Austen managed the same in the very first sentence of Pride and Prejudice. And I think if Kelton had sacrificed his research and his memoirs in favor of tightly crafted storytelling the way Austen did, this would have been a much, much finer novel. Overall, though, the beautiful pastoral writing and the eventual development of the main characters -- especially Charlie Flagg and his Mexican ranch hand's son Manuel -- can't compete with the pervasive political bias of the novel, which asserts itself in long, awkward treatises and monologues or forced "arguments" between the dogged Flagg and basically everyone else in the book. I don't mind political content in a novel, especially if it serves the story, but in the case of this book, the servitude is reversed. In an afterward to the edition I read, Tarleton State University professor Tom Pilkington remarks that "it would be a mistake, I think, to read into the novel a particular political message -- that all government aid should be sternly and righteously rejected." But that precise message comprises at least half of Charlie Flagg's speech and thoughts in this book, and as Pilkington notes, Charlie Flagg is presented as a "a genuine hero," so his is the voice of the whole novel. And every single character save one who accepts government assistance and offers a counterpoint to Flagg's perspective does so in weak, circular, repetitive illogic, always resorting to either an "everyone else is doing it" or a greedy "get yours while the getting's good" position, and every one of them, by the end of the novel, comes to ruination and in one way or another "concedes" that Flagg was right all along. The lone hold-out, the only character to offer the thinnest attempt at a serious argument against the novel's pervasive anti-government stance, doesn't make his stand until barely 10 pages form the end, and the best he can muster is "the system's broken, but the idea's still good." So I think it would be foolish to ignore the political message wedged into practically every page of this novel, and because the story and the characters become so servile to that message, it's hard to take this book seriously as a work of fiction. The setting is a 7 year drought on a West Texas ranch in the 1950's. Kelton grew up on a West Texas ranch in the 20's and 30's and brings the culture and country vividly to life. The main character, Charlie Flagg, is, of course, a rancher of the old libertarian strain and is modeled on Kelton's father. He is a man of principles who won't accept government aid for the drought and, as it turns out, it didn't make any difference anyway. This book was written in 1973 and is sympathetic to illegal al The setting is a 7 year drought on a West Texas ranch in the 1950's. Kelton grew up on a West Texas ranch in the 20's and 30's and brings the culture and country vividly to life. The main character, Charlie Flagg, is, of course, a rancher of the old libertarian strain and is modeled on Kelton's father. He is a man of principles who won't accept government aid for the drought and, as it turns out, it didn't make any difference anyway. This book was written in 1973 and is sympathetic to illegal aliens, just like our West Texas President. But,I don't think the book is intended as political philosophy. The theme seems to be to never give up, and in the end Charlie has endured even though he has lost all his cattle and is barely making it with a herd sheep. Possibly one of the best books I've ever read. I knew Mr. Kelton before he died and he told me this is one of his favorite books. I can't believe it took me this long before I read it. I could not give this book a higher recommendation. It perfectly embodies the life and spirit of the West Texas rancher. If you seek the soul of the Western border state ranchers and dry farmers, you will find it very difficult to put this book down. This is the best book I have read in a very long time! It is a novel but based on an actual event. The main character is so wonderfully developed. I can hear his voice and feel what he is going through. Elmer Kelton (1926-2009) was award-winning author of more than forty novels, including The Time It Never Rained, Other Men’s Horses, Texas Standoff and Hard Trail to Follow. He grew up on a ranch near Crane, Texas, and earned a journalism degree from the University of Texas. His first novel, Hot Iron, was published in 1956. Among his awards have been seven Spurs from Western Writers of America and Elmer Kelton (1926-2009) was award-winning author of more than forty novels, including The Time It Never Rained, Other Men’s Horses, Texas Standoff and Hard Trail to Follow. He grew up on a ranch near Crane, Texas, and earned a journalism degree from the University of Texas. His first novel, Hot Iron, was published in 1956. Among his awards have been seven Spurs from Western Writers of America and four Western Heritage awards from the National Cowboy Hall of Fame. His novel The Good Old Boys was made into a television film starring Tommy Lee Jones. In addition to his novels, Kelton worked as an agricultural journalist for 42 years. He served in the infantry in World War II. He died in 2009.